KUALA LUMPUR: Property prices in Nusajaya in Iskandar Malaysia, Johor, are expected to rise further as UEM Land Holdings Bhd and Iskandar Investment Bhd (IIB) plan to transform the area into a "smart+connected" community. In the last five years, property prices had increased by 10 to 30 per cent in East Ledang, Nusa Idaman and Horizon Hills in Nusajaya, said UEM general manager for strategic marketing, Zamri Ibrahim. He said houses sold at RM300,000-plus in Nusa Idaman in 2008 are now selling at more than RM400,000 each. Those launched in East Ledang around the same year have seen price increases of RM500,000 to above RM600,000. "Turning Nusajaya into a smart city will enhance the offerings in the market which would see the value of the properties appreciating," Zamri said. UEM owns 4,208ha of land in Nusajaya, a key component of Iskandar Malaysia. It is responsible for the development of five catalyst projects - Kota Iskandar (Johor state new administrative centre), the Southern Industrial and Logis-tics Clusters, the Puteri Harbour waterfront development, Afiat Healthpark and Nusajaya residences. 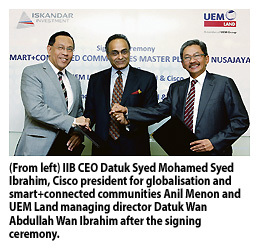 UEM and IIB yesterday signed a collaboration agreement with network system provider Cisco to develop an information and communications technology (ICT) and services smart city masterplan for Nusajaya. UEM and IIB will ride on Cisco's smart+connected community platform, which is the next generation of community development where cities are connected from an ICT stand- point. This will be the first smart+connected community development for Malaysia where services from retail to banking will be offered in an integrated manner. UEM managing director and chief executive Datuk Wan Abdullah Wan Ibrahim said a 12-week study is being undertaken, starting yesterday, to deliberate on its next step for the transformation plan. "There is a lot of space to introduce ICT at Nusajaya, at global standards," Wan Abdullah said after the signing. KUALA LUMPUR: Germany's Union Investment Real Estate GmbH (UIRE) has plans to buy a few more office buildings valued between RM200 and RM400 million here in the next two to three years. UIRE Asia Pacific Pte Ltd managing director Ulrich Dischler, however, said the investment firm has yet to begin talks with any local parties. "We take our time looking for opportunities within the RM200 million to RM400 million range and our focus will be in Kuala Lumpur for now," he told reporters after the handover ceremony of the CapSquare Tower from Bandar Raya Developments Bhd (BDRB) to UIRE here yesterday. The CapSquare Tower, an office block with 41 floors and 600,000 sq ft of net lettable space, was purchased by UIRE in 2008 for RM440 million. UIRE is an investment management company specialising in open-ended real estate funds for private and institutional investors with assets under management amounting to ?13.8 billion (RM59.2 billion). "We are in 26 countries with real estate funds of some 150 properties," said Dischler, adding that CapSquare is its first property in Malaysia. In Asia, UIRE is also in Singapore, South Korea and Japan. The handover ceremony yesterday was witnessed by Kuala Lumpur mayor Tan Sri Ahmad Fuad Ismail. Also present was BDRB chief executive officer Datuk Jagan Sabapathy and the German ambassador to Malaysia Dr Guenther Gruber. In his speech, Sabapathy noted that UIRE's investment in Kuala Lumpur's real estate market is a demonstration of its confidence in Malaysia's economy. "Indeed, despite the Lehman Brothers-led banking crisis in the US and Europe in 2009 that had a significant knock-on effect on global real estate, UIRE stood by and completed this purchase," he said. He added that BDRB is keen to further develop its relationship with UIRE in the future. CapSquare Tower is part of the overall CapSquare development covering some 6ha of land and home to Menara Multi-Purpose, two residential towers, Unitar city campus and CapSquare retail which in September will add several new tenants like Apple, Dell, a supermarket and Tanjung's TGV. PETALING JAYA: SP Setia Bhd's subsidiary, Setia (Hangzhou) Development Co Ltd, and Hangzhou Ju Shen Construction Engineering Ltd have terminated their joint-venture (JV) contract for the development of a mixed property project on 25 acres in Zhejiang, China. SP Setia said in a statement to Bursa Malaysia that the conditions precedent set out in the JV contract had not been met as at Wednesday. It was announced earlier that the JV contract was conditional on getting the approval from China's Ministry of Commerce or the approval authority that it entrusted. The first phase of the project, comprising commercial and residential units over five acres, was said to have a gross development value of RM500mil. The signing of the contract with Hangzhou Ju Shen to form a limited liability JV company to develop and operate the mixed property development in the growth corridor of XiaoShan, Hangzhou, took place in October 2009. The period for fulfillment of the conditions precedent set out in JV contract had been extended several times since. “The group still firmly believes that property development prospects in China are positive and will continue to look out for other suitable opportunities to invest in this exciting market. Investment funds originally earmarked for the Hangzhou project will be re-channelled accordingly when a suitable opportunity is identified,” SP Setia said. It said the termination of the JV contract was not expected to materially affect the future earnings of the company as it constituted only a small part of SP Setia's overall business. In a separate announcement to the exchange yesterday, SP Setia said its wholly-owned subsidiary, Setia Saigon East Ltd, and Saigon Hi-Tech Park Development Co had mutually agreed to extend the period for fulfillment of the conditions precedent set out in their cooperation agreement for a further 12 months to July 3, 2012 as certain conditions precedent had not been fulfilled. Setia Saigon formalised the agreement with Saigon Hi-Tech Park to jointly design and develop a mixed project on 79 acres in Ho Chi Minh City in January 2008.